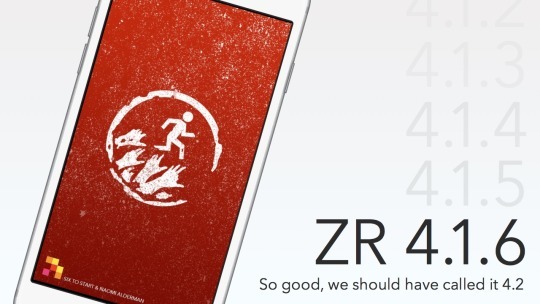 ZR 4.1.6 for iOS – Zombies, Run! We’ve unleashed Zombies, Run! 4.1.6 on iOS, introducing some all-new functionality and long-requested features. Time/Distance Runs – Want to push yourself with a longer 7k run? Got exactly 33 minutes to save the world? 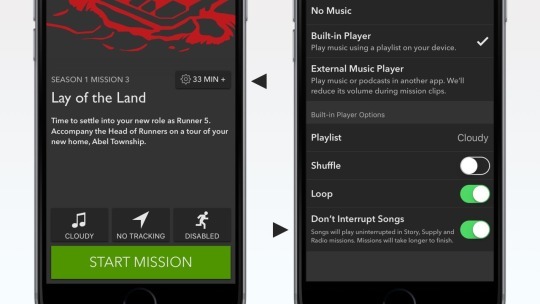 You can now set your run to a specific distance or time, and we’ll match that with your music and mission clips. Tap the new ‘cog’ icon on a mission screen to set it up. Uninterrupted Music – The perfect track can get you in the zone like nothing else. If you listen to longer music tracks in Built-In Music mode and don’t want them to be interrupted by mission clips, there’s a new ‘Don’t Interrupt Songs’ option on the Music screen. Auto-Download Next Mission – You can now choose to have your ‘Next Mission’ (as shown on the home screen) be automatically downloaded in the background. Stay In Sync – Don’t touch that ‘Synchronise’ button… runs will be automatically synced with ZombieLink much more regularly. We’re really pleased to add these features, some of which we know have been requested by a lot of people. We think the time/distance runs will be a great way to help you train and schedule your runs, and that feature in particular will underpin our next big 4.2 update! Android users will know that we’ve released 4.1.10 recently, which massively speeds up startup time, as well as fixing some little crashes. What’s next for Android? Oh, just this little thing called… Interval Training! Previous Post Any updates on Zombies, Run coming to the Apple Watch?